“Stable landslide” sounds like a contradiction in terms, but there are indeed places on Earth where land has been creeping downhill slowly and harmlessly for as long as a century. But such stability does not necessarily last forever. 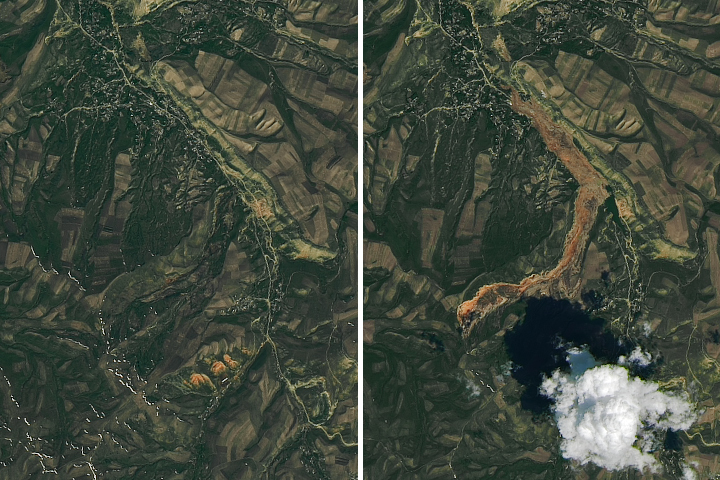 For the first time, scientists have documented the transition of a stable, slow-moving landslide into a catastrophic collapse, showing how drought and extreme rains likely destabilized the slide. The study by researchers from NASA’s Jet Propulsion Laboratory (JPL), the University of Maryland, Portland State University, and the University of California, Berkeley, was published on February 7, 2019, in Scientific Reports . The Mud Creek landslide near Big Sur, California, dumped about 6 million cubic yards (5 million cubic meters) of rock and debris across California Highway 1 on May 20, 2017. The damage took more than a year and $54 million to repair. 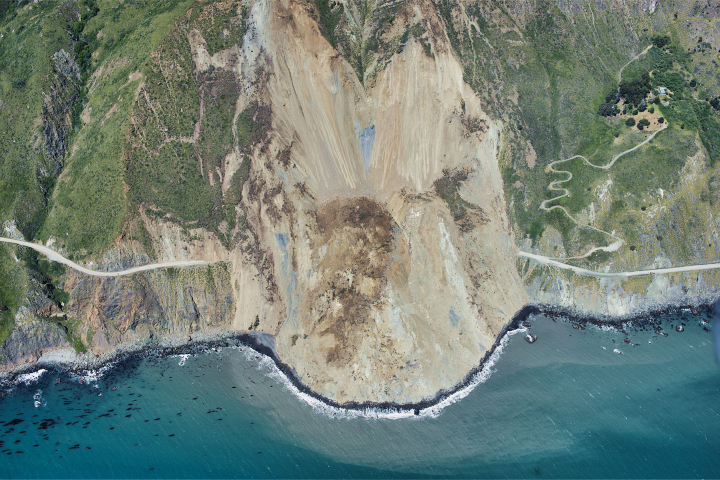 No long-term motion had been documented at Mud Creek before this event, but workers in the state's transportation department had noticed small mudslides in the weeks before the collapse and closed the highway as a precaution. 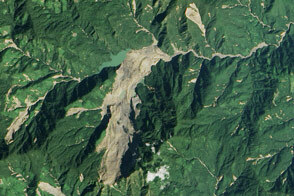 The aerial photograph of the landslide (above) was shot by the U.S. Geological Survey. Using an eight-year data set from the Uninhabited Airborne Vehicle Synthetic Aperature Radar (UAVSAR), a JPL-led research team has identified Mud Creek as a stable landslide. The scientists processed the data with a technique called interferometric synthetic aperture radar processing (InSAR) and calculated that Mud Creek had been sliding at an average speed of about 7 inches (17 centimeters) per year since at least 2009. They also used data from the European Space Agency’s Sentinel-1A/B satellite to document how the behavior of the sliding area changed. The animation above shows velocity changes in the slide area from March 2015 to May 2017. Note how the slide speeds increased with the rains in the winter of 2016 and then slowed again until the following winter. After the 2017 rains, the sliding slowed in February but began to accelerate again in March and continued until the May collapse. 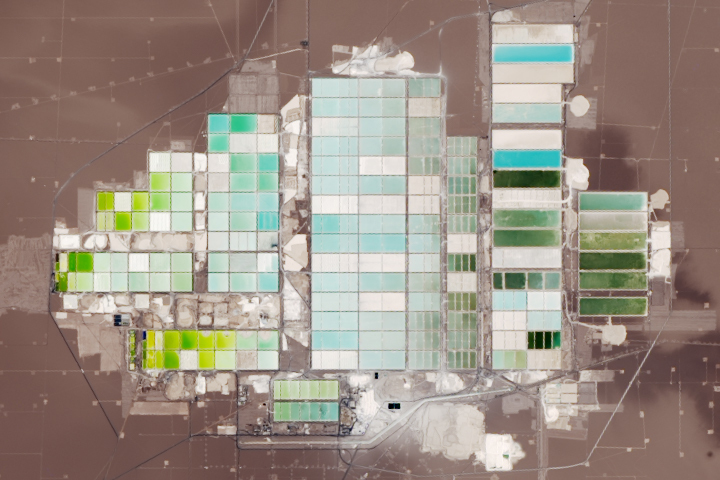 Data from aircraft and satellites can only measure changes at the ground surface, however. 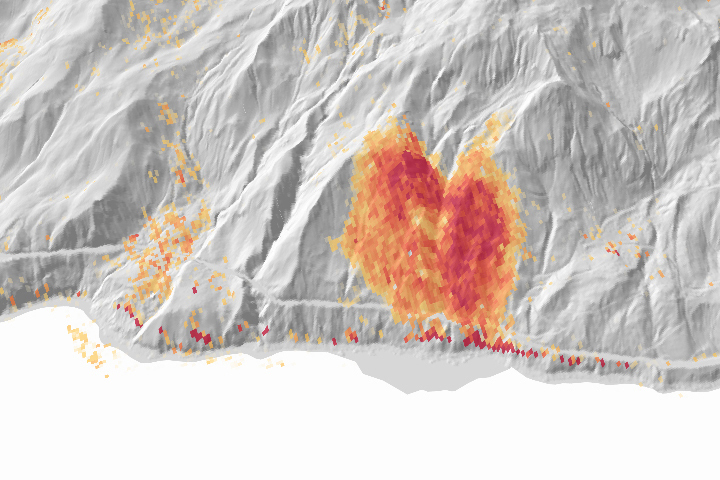 “From that, we tried to infer what may have happened to the landslide’s sliding surface, tens of meters underground, that allowed the Mud Creek slide to transition from stable to unstable,” said the study’s lead author Alexander Handwerger of JPL. 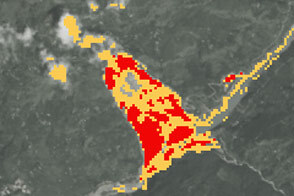 The collapse happened after several days of heavy rainfall during one of the wettest years in a century for this area. Before 2017, a five-year drought had produced several of California's hottest and driest years ever. Using a computer model of how water affects soil, the researchers studied what would happen as the intense rains saturated the parched ground. They noted that water would replace air in the tiny spaces between soil particles, greatly increasing the pressure on the particles. This pressure change could have destabilized the sliding surfaces below ground and triggered the collapse. 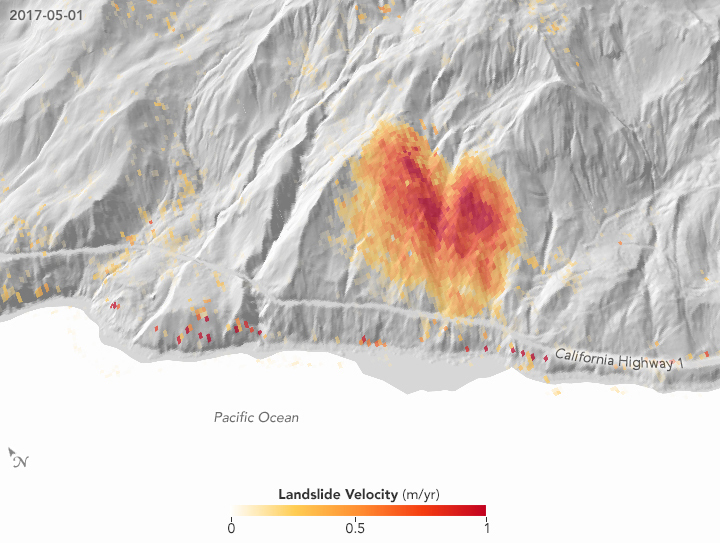 California has more than 650 known stable landslides. If one began losing stability in the future, could InSAR data reveal the change? To answer that question, the team compared Mud Creek with two other stable landslides in similar types of soil and rock. Paul's Slide, only 13 miles (21 kilometers) north of Mud Creek, endured the same weather conditions in 2017 yet did not fail catastrophically. Another slow landslide area in Northern California received 3 feet (1 meter) more rainfall than Mud Creek without catastrophic failure. “We thought if we compared these two cases that didn't fail to the one that did, we might find some characteristic velocity pattern that would be a warning that a slide was going to fail catastrophically,” Handwerger said. 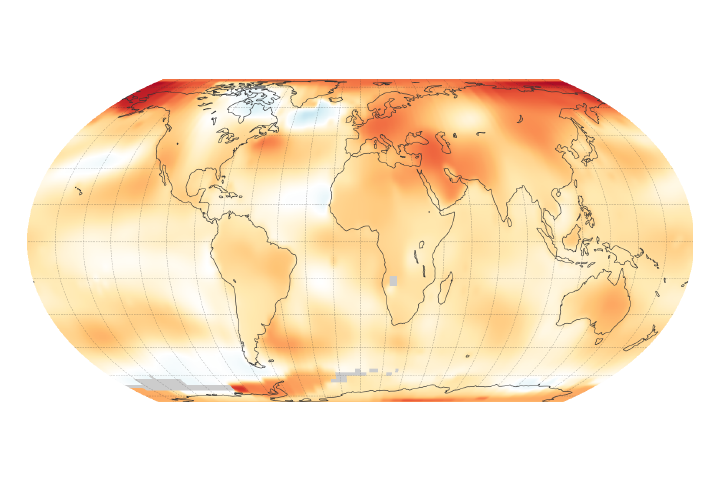 NASA Earth Observatory visualizations by Lauren Dauphin, using data courtesy of Alexander Handwerger and Eric Fielding of NASA JPL and the USGS 3D Elevation Program (3DEP). Aerial image courtesy of USGS Sound Waves. Story by Carol Rasmussen, NASA’s Earth Science News Team. In spring 2017 a landslide closed Route 1 near Big Sur, California. A second, larger landslide spilled debris into the ocean. Handwerger, A. et al. 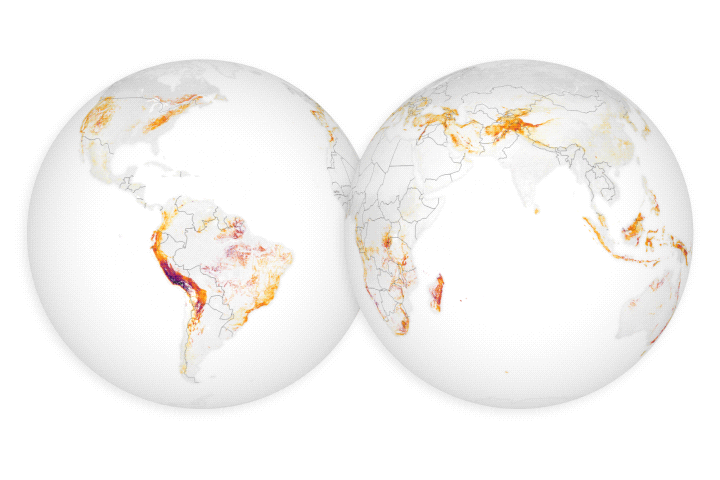 (2019) A shift from drought to extreme rainfall drives a stable landslide to catastrophic failure. Scientific Reports, 9, 1569. 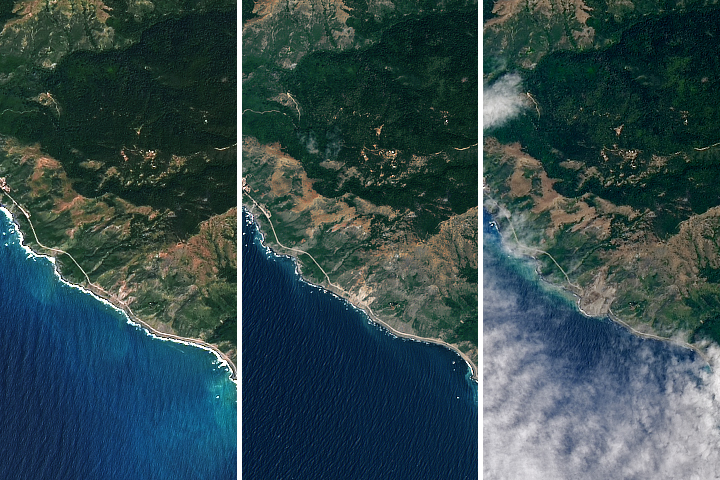 NASA Earth Observatory (2017, May 25) Landslide Buries Scenic California Highway.